Both coffee and tea came to Britain in the seventheenth century, but in the 1930s, tea was univerally popular and coffee was the drink of the few. In 1938 people spent twenty times as much on tea as they did on coffee  and a survey from the same year  showed that coffee consumption rose with income. Coffee became more popular in the 1950s. The main reason was the spread of instant coffee. Nestl� launched Nescaf�, the first instant coffee in 1938 , but it took another fifteen years before people substituted instant coffee for tea. Coffee drinkers of the 1930s and 1940s mostly made real coffee, although Camp Coffee, a liquid coffee essence, had a following because it was easy to make. Most people made coffee in a jug. You boiled the water and added it to ground coffee already in the jug. You let the ground coffee settle and it was ready to pour through a strainer and drink. Some people then boiled the coffee again. One in four people thought a percolator was the best, but also the most time-consuming method. They disagreed over whether the coffee should be boiled or not. A minority added salt to the coffee to bring out the flavour. Most people drank their coffee with milk and liked it with hot milk. If you would like to try making coffee the old way, here are a few suggestions. My grandmother went to the Cadena Caf� in Leamington Spa to buy ground coffee and made her coffee in a jug. You can also strain the coffee into a coffee pot to serve. This method makes strong, dark coffee. If you prefer milk with your coffee, Good Housekeeping suggested serving it with hot milk, one part milk to two parts coffee. The Melior Coffee Pot was what we would call a cafetière today. However, we did not call them cafetières until 1969 when a company called Household Articles Ltd launched the Chambord style cafetiere in the UK under the brand name 'La Cafetière'. The Melior Coffee Pot was a silver plated, ceramic or enamel pot with a cafeti�re style filter which you pushed down once the coffee had brewed. It had a small band of loyal followers. Put the coffee and cold water in a saucepan and heat it to just below boiling point stirring as it heats. Then turn the heat down and cover the saucepan. Leave for five minutes and strain into a warmed jug to serve. An alternative is to make it with milk instead of water. In 1939 The Times suggested that every soon-to-be-wed couple asked for an electric coffee percolator on their wedding list. A large percentage of newly-weds that read The Times might have asked for one, but most people preferred tea to coffee and probably did not have an electric socket to plug one into. 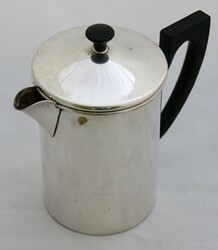 Stove top percolators were more common in the 1930. Electric ones caught on in the 1950s and 1960s. Coffee percolators work by forcing boiling water up through a tube and out over a perforated basket containting ground coffee. The water trickles back through the basket allowing the coffee to flavour the water. The basket has a large number of small holes: in the top which allow the water in; and in the the sides and bottom allow the coffee out. The tube has a base with an inverted funnel. The tube goes through the basket and a hole at the top allows water to escape. You fill the basket with 1�oz of coffee per pint of water and put cold water in the percolator. You then put the percolator a stove. You need to keep the percolator gently simmering for about ten minutes. Electric percolators have a built in heating element and do not need to be heated on a stove. Coffee made this way can be quite weak to modern tastes. Percolators also boil the coffee, which is not great for the flavour. I found the best perocolator was the one Which? recommended in 1964, the American made Pyrosil. This made passable coffee, but was expensive to buy at �5 17 6d (or �80 in today's money). It had the advantage of a ceramic jug and stainless steel basket. 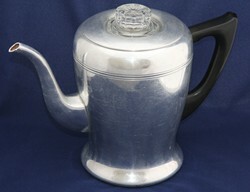 Cheaper percolators used aluminium parts, which may taint the flavour. Although glass percolators give you the chance to see the colour of the coffee and judge the strength of the brew. 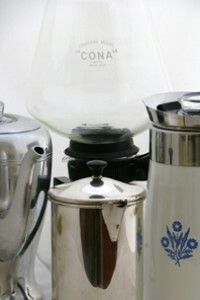 A selection of percolators available in the 1960s is as follows. You will be able to find some of these on eBay. Source Which?, February 1964 page 50, published by the Consumers' Association. Prices are in � s d.
Vacuum coffee makers look like a scientific instrument. This method of making coffee is the most exciting to watch. 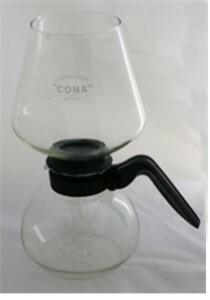 The most well-known vacuum coffee maker is the Cona. The vacuum coffee maker has two glass or aluminium vessels one inverted and fixed on top of the other. Some kind of valve connects the two. In a Cona, this is glass plug. You put water in the bottom vessel and coffee in the top one. You then put the coffee maker on the stove and heat the water. When it boils, presssure forces the water into the upper vessel. The valve allows the water to go up, but does not let the ground coffee escape. After a couple of minutes, take the coffee maker off the heat. Magically, with the pressure removed, the brewed coffee runs back in to the bottom vessel. I tried this with Cona. The biggest problem was removing the upper vessell (or funnel as Cona called it) after the coffee had brewed. The whole apparatus was hot and the funnel was fragile, it was difficult to do this easily. Nevertheless it made great tasting coffee. It was much nicer than percolated. I think this is because the brewed coffee is not boiled. As coffee bars becaome popular in the 1950s, people wanted to make espresso at home. I should not exaggerate this too much as they were a minority thing in the 1950s, popular with only the upper middle classes. They were more common in the 1960s and more so in the 1970s. Probably the first home espresso maker people used in Britain was the Vesuviana which was imported into the UK in limited quantities in the 1950s. 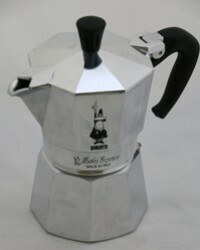 The most popular espresso maker in the 1960s and 1970s was the Moka Express. This is the model I tested. Espressos make coffee by forcing water through the ground coffee under pressure. I found the Moka Express made very good espresso. This is essentially filter coffee, but made by pouring boiling water onto coffee in an upper vessel and letting it run through the coffee into a pot below through a filter, which keeps the ground coffee separate. In the 1960s devices such as the Melitta 101 introduced the idea of filter paper. Filter coffee makers, as we know them today, did not come along until the late 1960s and became more popular in the 1970s and 1980s. Nestl�: 125 Years, 1866-1991, Jean Heer, B. J. Benson, published 1991 page 170. I guess it depends on the model. Is it still made today? If not your best bet is to buy another one on eBay. We found the Pyrosil to be pretty good. 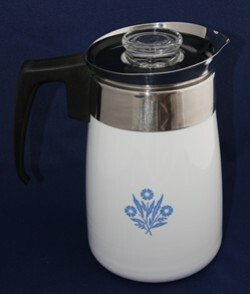 See the links above for percolators for sale in eBay.